North Korean leader Kim Jong Un shakes hands with China's President Xi Jinping, in Dalian, China in this undated photo released on May 9, 2018 by North Korea's Korean Central News Agency (KCNA). Reports that Chinese President Xi Jinping will visit North Korea in September raise questions about whether Beijing will ease sanctions against Pyongyang, as relations between China and the U.S. grow increasingly tense over trade. “Like the proverb ‘the enemy of my enemy is my friend,’ China is complying with North Korea’s requests,’’ said Woo Su-keun, a North Korea analyst and political science professor at Donghua University. The Singapore Straits Times newspaper reported on Saturday that Xi would attend the celebrations of the 70th anniversary of North Korea's founding, in Pyongyang on September 9, at the invitation of North Korean leader Kim Jong Un. The report has not been confirmed by the Chinese Foreign Ministry. The Daily NK online newspaper and the Korea Times newspaper in Seoul also recently speculated that North Korea was preparing for a visit from the Chinese head of state, based in part on reports that Chinese border patrols along the North Korean border have increased, and that Pyongyang has suspended visiting tour groups. If confirmed, it would be the Chinese leader's first visit to the North Korean capital since he took power in 2012, and 13 years after the last visit by a Chinese President, when Xi's predecessor Hu Jintao visited in 2005. The young North Korean leader, who assumed power in 2011 after his father Kim Jong Il died, has had strained relations with Xi. Until this year Kim declined to visit his most important economic and strategic ally, and ignored Beijing’s counsel to refrain from provocative nuclear and ballistic tests. In response, Xi supported increasingly restrictive rounds of Untied Nations sanctions that now block most financial transactions and 90 percent of all trade with North Korea. But this year Kim sought to repair his damaged relationship with Xi, as he pivoted to suspend further weapons tests and agreed to work toward the denuclearization of the Korean Peninsula, when he met with U.S. President Donald Trump in Singapore, and during the inter-Korean summit with South Korean President Moon Jae-in. 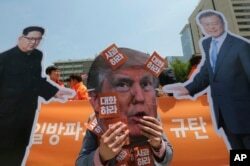 A protester wearing a mask of U.S. President Donald Trump, center, performs with cut-out photos of North Korean leader Kim Jong Un and South Korean President Moon Jae-in, right, during a rally against the United States' policies. The North Korean leader also visited Xi in China three times this year and discussed improving cooperation between the two countries and economic reforms. Kim reportedly invited the Chinese president to Pyongyang during their first meeting in March. Beijing has recently called for easing of sanctions on North Korea but needs agreement from all members of the U.N. Security Council, including the U.S., to alter the restrictions that were unanimously agreed upon. However there have been reports that China has permitted increased smuggling with North Korea in the wake of Pyongyang’s suspension of nuclear tests, and there are concerns that a possible Xi visit to the North will further expand informal economic ties. “If Xi Jinping visits Pyongyang this time, although it would be difficult to take a step in lifting the official sanctions at once, he could promise to prevent the North Korean regime from facing a crisis,” said Ahn Chan-il, a North Korean defector and analyst with the World Institute of North Korean studies in Seoul. At the same time, nuclear talks between Washington and Pyongyang have stalled over U.S. insistence that sanctions remain in place until North Korea fully dismantles its nuclear arsenal. The Kim government wants early sanctions relief for incremental progress, and a joint peace declaration to replace the 1953 armistice that has been in place since the end of the Korean War. China’s increased support for North Korea may also be a strategic move to link denuclearization progress to resolving growing tensions with Washington over the U.S. trade deficit with China and accusations of unfair trade practices by the Xi government. U.S. Secretary of State Mike Pompeo is expected to visit Pyongyang soon for another round of nuclear talks, said President Trump’s National Security Adviser John Bolton on Sunday. Lee Yoon-jee contributed to this report.